We have to acknowledge something upfront. The word 'paranoia', as defined by the Merriam-Webster dictionary, is "a psychosis characterized by systematized delusions of persecution or grandeur usually without hallucinations" and/or "a tendency on the part of an individual or group toward excessive or irrational suspiciousness and distrustfulness of others"(emphasis mine). The actions taken by the characters in Paranoia, conversely, are not delusions or irrational. In fact, Liam Hemsworth's character of Adam in the film is actually correct in his suspicion that he is being watched by nefarious forces. Being right about being pursued, however, is about the only thing Paranoia the film does right, for this movie bungles just about everything else. At the screening I attended, certain moments were met with howls of laughter and disbelief. If I'm honest I have to say I didn't hate Paranoia, but I also see that so much went wrong it becomes more entertaining to see how cast and crew got into this mess than it is seeing the characters get out. Adam (Hemsworth) is a Brooklyn kid yearning to move ahead and join that fabled One Percent. While technically proficient, he still is a drone at Wyatt Industries. After he and his coworkers give a disastrous sales pitch to CEO Nicolas Wyatt (Gary Oldman) they are all promptly fired. With Adam still holding an expense card, he treats his buddies, including his best friend Kevin (Lucas Till) to a night on the town, where Kevin hooks up with fellow ex-drone Allison (Angela Sarafayan) and Adam hooks up with Emma (Amber Heard), who has a thing for "bridge and tunnel" guys (those who live in the ghetto of Brooklyn versus the posh Manhattan. Adam's little venture into larceny is quickly found out (like the next day) but neither Wyatt or his henchman Miles Meecham (Julian McMahon) seem particularly bothered with this. Instead, Adam is the perfect person to do some industrial espionage against Jock Goddard (Harrison Ford), who has made a career from his former protégé Wyatt's work. With a little training and make-over by Wyatt's right-hand woman Judith (Embeth Davidtz), Adam goes from 'bridge and tunnel' to posh genius. Adam gets hired by Goddard, who once had a son. Goddard soon takes a shine to Adam, as does Emma, who just happens to work for Goddard's company of Eikon. Adam develops Type X or a 3PS system (which can pinpoint the location of someone in a group of threes), and Type X has military applications which makes it highly valuable. However, strange things are happening. Adam is confronted by an FBI Agent (Josh Holloway), who tells him that others who have gone from Wyatt to Eikon have met gruesome ends, Adam finds his homes is bugged en masse, and to show how serious Wyatt and Meecham are for him to get the latest technological breakthrough, someone runs Kevin down. In the end, the generally moral Adam must choose what to do to save himself, protect Emma and his father (Richard Dreyfuss) and bring the bitter rivals of Wyatt and Goddard down. We have one or two 'twists' in Paranoia that are suppose to be shocking, but more on that later. In the end, we find out who has set Adam up and Adam cuts a deal that allows him to save himself and those he cares about. We should also acknowledge that truth be told, Paranoia is in reality the true Biggest Bomb of 2013. 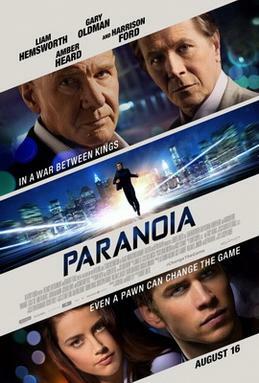 Paranoia was released on August 16, 2013. I saw it on September 26, 2013 in a second-run theater. It was pulled from the cheap theaters after one week. Even other theatrical disasters (The Lone Ranger, R.I.P.D., After Earth) lasted longer in both first and second-run theaters than Paranoia. The reasons for Paranoia's disastrous run are many. Let's start out with the obvious: despite both Oscar-nominees Oldman and Ford being in the film (their first together since the far-better Air Force One), the central focus was on the youngest Hemsworth Brother, who despite his beautiful figure and form is A.) not a big-enough name to draw audiences, and B.) pretty (and pretty lousy) in Paranoia. Having seen only two Liam Hemsworth films (The Last Song and The Hunger Games), I am not convinced that Liam is an actual actor. Like Taylor Lautner and Channing Tatum, he is very pretty to look at, but has absolutely no range. I won't compare Liam to his oldest brother Chris only because despite being a Norse God I haven't been particularly impressed with him either (though in fairness, his films have been as of today's writing action films, so I haven't seen a truly dramatic or comedic role). Anyway, back to Liam. He was shockingly flat and blank, having no expression in any situation. Whether it is a love scene or attempting to show emotion in his scenes with Dreyfuss, he not only has the same face but forces the words out rather than conveys conviction with his dialogue. It's already bad enough that Jason Hall and Barry L. Levy's screenplay (adapting Joseph Finder's novel) makes Adam a remarkably stupid character (for someone all but blackmailed to be an industrial spy, he is genuinely SHOCKED to find his home has hidden cameras) but what passes for shocking is all but told to us in Hemsworth's voice-over (and longtime readers know how much I detest voice-overs). Early on I wondered whether Jock sensed that Adam was a spy because under Robert Luketic's direction it looks like Ford and Hemsworth were told to play the scene as if both knew that the other knew his real motivations. I can digress to wonder why a director known more for frothy but dimwitted romantic comedies (Killers, The Ugly Truth) would be asked to make what is suppose to be a gritty action drama, but in Paranoia he failed to make things either dramatic or action-oriented. I like some of Luketic's movies (Legally Blonde, Monster-In-Law...the latter a guilty pleasure), but Paranoia is a showcase for bad acting almost all around. Beard is not just wasted as "the girl", but one never believes she was the passionate go-getter or bright up-and-comer (nor how she never bothered to tell anyone the guy was a fraud). Ford and Oldman took these Bartha roles and decided to have fun with them. Ford was growly as Goddard, Oldman was rant-worthy as Wyatt. I can't say it was sad seeing these two great actors (and Dreyfuss, who apparently gets what he can get but whose character could have been cut out without blocking the flow of the story) do shoddy work, but so long as they had fun. Holloway was in two scenes at the most, and how his agent came together with Adam (or the story at all) is left unanswered, and McMahon loved playing up the 'I'm EVIL' character who is auditioning as the next James Bond henchman. Till is the only one who appears to do anything of note as the perpetually put-upon nerdy best friend (though when Allison starts texting rather than call the police when Kevin is rundown I was the one howling with laughter). On the whole I won't lie and say I didn't enjoy Paranoia; it was amusing (though not in the way intended) and I have seen worse this year. I, however, recognize Paranoia is not so much bad as it is inept, but it's one of those films we'll look back on with wry amusement, and that can actually entertain if you never bother to think. The biggest shock about Paranoia is that it is the SECOND-WORST thing Liam Hemsworth has been involved with in 2013.